As the leading security system provider in the state of Texas, True Protection provides home and business owners with customized security systems to fit their needs. Whether you’re in Austin, San Antonio, Houston, or Dallas/Fort Worth, our team of local security experts are happy to help you find the best security system for your property. We offer a variety of security systems for your home and business. Our systems are designed to give you peace of mind and protect your business and home from intruders. We also install fire alarm systems and video surveillance to better protect your family and property. Protect your family and home with our wide variety of home security systems. Each system is customized to fit your needs using a combination of wireless sensors on doors, windows, and other areas throughout your home. True Protection is the security system of choice for many commercial businesses. Unlike other commercial security companies, we do not increase the cost of equipment or monitoring when setting up a business, regardless of size. True Protection started in 2011 and has provided superior security products and services at an affordable price in the Austin, San Antonio, Houston, and Dallas/Fort Worth areas. Since then, we have remained committed to providing quality security systems with a strong focus on customer service and building long-lasting relationships with our customers. Fill out our secure form below or call us at 800-308-2641. Alarm.com Powered Security System Did we remember to arm the security system? 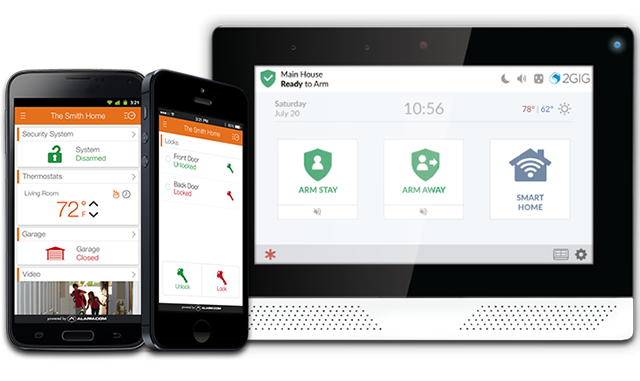 With an Alarm.com powered security system, you can arm and disarm your security system from anywhere in the world with the push of a button. Alarm.com Powered Connected Home Honey, Did We Lock the Door? Check from your phone and keep your vacation on track. Alarm.com 1080p Indoor Camera Oh look, the kids just got home from school Stay connected to your home and make sure your family is safe with Alarm.com indoor cameras. Alarm.com Doorbell Camera Who's at the front door? Use your Alarm.com doorbell camera to see who is at the front door without having to interrupt your family dinner. Video Surveillance Packages Monitor Your Home or Business From Anywhere Remotely view your home or business with True Protection's video surveillance packages. The price is very reasonable and the service is amazing! Thank you for keeping our family safe. Can’t say enough good things about them. Highly recommend. This wireless system works very well, is very easy to install, and very user friendly. You can even activate it from your phone. The price is very reasonable and the service is amazing! What more do you need? I never write reviews but I felt I had to do it for this one! True Protection is AWESOME! They have wonderful customer service and quick installation. We have used many well-known name brand security systems in the past, but none have given us the one on one attention that True Protection has provided. Thank you for keeping our family safe. I have been using True Protection for the last year and a half and they are amazing! They take you through everything step by step and are always there if you have any questions or concerns. Amazing customer service. Beautiful “Apple-esque” alarm system. Can’t say enough good things about them. Highly recommend. We use the latest industry technology and resources in order to offer our customers the best home safety options.